These are available in single & double stage and are oil sealed, rotary vane type positive displacement pumps where, not only complete assembly is immersed in oil but shaft seal is also designed in such a way that it totally eliminates the possibility of suction of air through it. 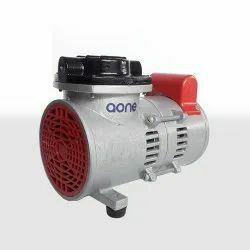 These are designed to achieve maximum vacuum in a very short time and rise in temperature of the unit also remains under check, which in turn reduces the wear and tear of its components and makes it suitable for noiseless and trouble free performance for years and thus helps in reduction of repair bills. These pumps are very compact and are so simple in design that all minor repairs, in case of need, can be carried out easily without removing the main housing from its base plate and without disturbing the alignment. In industrial models, or in vacuum pumps of higher capacities which are operated continuously for very long spells of time the oil gets heated either on account of friction or on account of heavy intake of hot mixture of gas and vapours, the performance of the pump drops. In order to keep it cool, a jacket is constructed around three sides of the pump housing, in which water is made to circulate for keeping the temperature of vacuum pump under control and retaining the performance at its best. 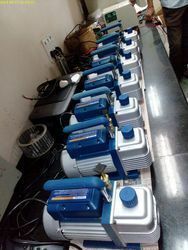 In this model an inbuilt device, known as Gas Ballast is provided, which effectively checks to a large extent condensation of the water vapours which otherwise would not only had contaminated the oil, but had also diminished the performance of the pump. 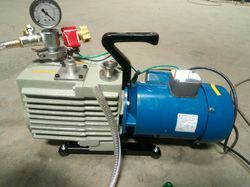 We are reckoned manufacturer and supplier of superior quality range of Oil Seal Dry Vacuum Pump. 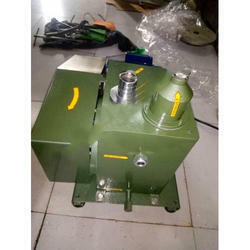 These vacuum pump are fabricated using best quality raw material and advance technology. Furthermore, we assure the timely delivery of this product. High Vacuum Pump’s Direct Drive STDD Series Rotary Vane Vacuum Pumps feature micron range ultimate vacuum and reliable operation. STDD Series Vacuum Pumps are proven performers in industrial, laboratory and Refrigeration applications where dependable performance, small footprint, and quiet operation are essential. These are cooled pumps feature a two-stage design and come standard with NW type inlet and outlet connections. Compound stage design and adjustable gas ballast enable these pumps to operate at low noise level.